Summer is here and there is no better time to enjoy a bowl of chilled sweet cherries! This month, we chose to feature this dessert-like fruit, which is unmatched by any other fruits for its sweet indulgence. Whether you choose the premium, golden Rainier cherries, dried tart cherries, or the preserved bright-red maraschino cherries, there is no shortage of ways to enjoy them. Summer is the peak season for sweet cherries, such as Bing and Rainier cherries, which are typically grown in the Northwestern states of Washington and Oregon. Tart cherries, like the Montmorency and Balaton varieties, are produced year-round in Michigan, where 75% of the nation’s tart cherry crop is grown. 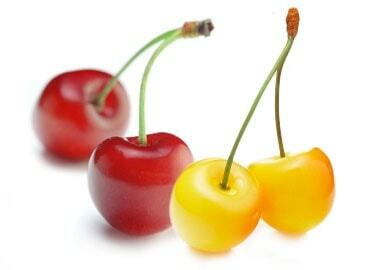 The rich colors of cherries are an obvious sign that these superfruits are abundant in many nutrients. According to the Cherry Marketing Institute, tart cherries are excellent sources of beta carotene and Vitamin C and Vitamin E, and provide potassium, magnesium, iron, folate and fiber. Although both the sweet and tart varieties are high in antioxidants and various phytonutrients, tart cherries are especially high in anthocyanins and flavonoids. These biologically active plant compounds have been shown to be potentially beneficial to heart health, and may help relieve pain associated with arthritis, inflammation and gout. In a 2006 study, researchers from the US Department of Agriculture found that certain markers of inflammation decreased by 25% upon supplementing participants’ diets with Bing cherries (signs of inflammation are associated with heart diseases). A team of Michigan State University researchers reported in 2001 that the anthocyanins in tart cherries function like pain killers in our bodies, with one serving of canned tart cherries functioning like 1.4 grams of aspirin. When buying fresh sweet cherries, pick the bags that contain more dark-colored, firm cherries, as they tend to be sweeter than the bright red or squishy ones. Check carefully to avoid bags that contain moldy or rotten fruit. Enjoy them in trail mixes, or on their own as a quick antioxidant-rich snack break. Instead of using raisins, try using dried cherries in cookies. Throw this bright red nutrition powerhouse into your yogurt, salads, and even rice pilaf to add flavor and texture. These are great in smoothies and other frozen desserts. Swap the regular berries in your muffin recipe with frozen tart cherries for a change. Frozen tart cherries on their own make the perfect healthy summer treat!